On this date in 1937, Azerbaijani actress Panfiliya Tanailidi (various other transliterations are possible) was purged during Stalin’s terror. 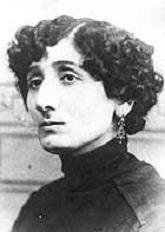 Born in a tsarist governorate to Greek emigres, Tanailidi (English Wikipedia entry | Azerbaijani) was treading the Caucasus boards as a teenager in the pregnant century’s first decade. She became an accomplished stage and screen actress, starring in 1930s silents Ismet and Almaz. Come the Stalin years when any pretext was enough to destroy a body, the pretext against Tanailidi was apparently her affiliations with an Iran then taking a concerted anti-Soviet line: the actress had toured Iran in 1917 and had friends like Govhar Aliyeva who had fled the Soviet Union for Iran. This was more than enough to cast the pall of espionage about her.